Eddie Muller and the Film Noir Foundation return to Seattle after a two year hiatus following their International Edition in 2014 with bold new 35mm prints courtesy of their collaborative efforts with The UCLA Film & Television Archive. The Preservation Society and it's annual touring festival, offering one of the country's most, "Fascinating Windows into Our Cinematic Past". The work of the restorationists at the archive feature prominently in the LA Weekly's discussion of the expansive shift to digital distribution and projection nationwide, "Movie Studios are Forcing Hollywood to Abandon 35mm Film. But the Consequences of Going Digital are Vast, and Troubling". Their work will again be on display after the selections from the UCLA Festival of Preservation featured at Northwest Film Forum this past May. Next week's Noir City 2016: Film Noir from A to B screens exclusively on 35mm, comprising nine double bills that present a chronological excursion through the classic Noir era, with themed pairs of "A"-list and "B" titles playing together. Highlights from this year's program include a new restoration of Norman Foster's once thought lost, "Woman on the Run", a breakneck thriller about a search for a husband in hiding, set in mid-20th Century blue collar San Francisco. We also see the characteristic atmospheric nature of the genre highlighted in the haunting chiaroscuro of cinematographer Nick Musuraca. Accentuating another notable Val Lewton production for RKO, his camerawork highlights the Greenwich Village missing person (and secret society) mystery of Mark Robson's "The 7th Victim". Hitchcock protege, screenwriter and producer Joan Harrison's stamp is all over Robert Siodmak's tense thriller, "Phantom Lady". The film pivoting around Ella Raines' enchanting lead role as savvy urbanite and amateur investigator, as she gets in deep in an attempt to exonerate an innocent man of the murder of his wife. In addition to Siodmak, other great German expat directors of the era also put in entries, like Fritz Lang in the classic Edward G. Robinson vehicle, "Scarlet Street" in which Robinson gets rolled by Joan Bennett's streetwise lady of the night. And Max Ophüls adaptation of Elizabeth Saxnay Holding’s novel "The Blank Wall" about the lengths one woman will go to protect her daughter from a scheming blackmailer. Star power also features with Humphrey Bogart and Lizabeth Scott in John Cromwell's post-War twisted tale of fake identities and murder set in Florida, "Dead Reckoning". 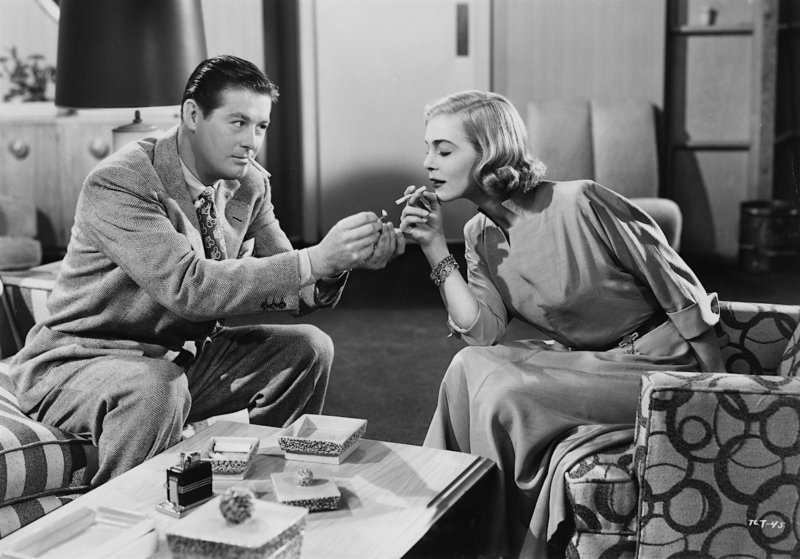 And a second serving of Lizabeth Scott's smokey charm, staring again in Lewis Allen's Technicolor love triangle melodrama, "Desert Fury" set against lowlife gamblers, duplicitous deputies, and rebellious kin. The weeklong program also features Frank Tuttle's seminal revenge film, "This Gun for Hire" based on the Graham Greene novel of the same name, and Bruce Humberstone's unjustly overlooked harbinger of the film noir movement, "I Wake Up Screaming" starring a young Betty Grable in one of her first dramatic roles. Cornell Woolrich might be Noir's most prolific screenwriter, and when you can consistently deliver works like the unreliable narrator featured in John Reinhardt's "The Guilty" practically by rote, there's little wonder why. The festival also hosts rare pulp entries like Henry Levin's clandestine release of one of the most sexually suggestive and psychologically lurid B-movies of the 1940s onto the American screen with "Night Editor". Intended as the first in a trilogy of thrillers about about graveyard-shift police beat reporters, and the crimes in which they become entangled, the film stands as the single entry due to the Motion Picture Production Code crackdown of the Breen era.